The 2018 edition NFPA 54 Set combines everything you need to know about fuel gas safety and compliance -- for 15% off. Use the 2018 edition NFPA 54: National Fuel Gas Code and Handbook Set to bring your knowledge about fuel gas-related fire and explosion risks up-to-code with the latest safety protocols. The 2018 edition NFPA 54/ANSI Z223.1: National Fuel Gas Code provides new industry-accepted guidance for the safe installation and operation of fuel gas piping systems, appliances, equipment, and accessories. Its unique Handbook helps you answer questions from employers and owners, and verify that jobs are in compliance. Save 15% on the Set that helps engineers, contractors, and consultants keep jobs on time and up-to-code. You'll receive the 2018 edition of NFPA 54/ANSI Z223.1: National Fuel Gas Code, so you're confident you're working with the latest requirements, including current information on the bonding requirement for corrugated stainless steel tubing (CSST). You'll also receive the 2018 edition NFPA 54 Handbook, your go-to source for the "hows" and "whys" behind fuel gas safety compliance. 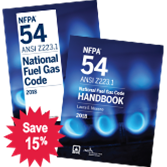 Written by a panel of fuel gas safety experts, the Handbook helps you implement NFPA 54 using the complete 2018 NFPA 54 Code text; updated commentary; more than 200 visuals including color photos, graphics, and charts; calculation worksheets; and updated FAQs highlighting vital aspects of gas safety. When it comes to fuel gas safety, nothing compares to the comprehensive 2018 edition National Fuel Gas Code and Handbook Set for engineers, contractors, consultants, AHJs, designers, and architects. Discover how the 2018 NFPA 54 Handbook can help you apply National Fuel Gas Code requirements. It includes the full code text, plus in depth explanations, and visual references. You'll find guidance that helps you comply the first time. The 2015 NFPA 54 Set combines everything you need to know about fuel gas safety and compliance -- for 15% off. Use the 2015 edition of NFPA 54: National Fuel Gas Code and Handbook Set to bring your knowledge about fuel gas-related fire and explosion risks up-to-code with the latest safety protocols. The 2015 NFPA 54: National Fuel Gas Code provides new industry-accepted guidance for the safe installation and operation of fuel gas piping systems, appliances, equipment, and accessories. Its unique Handbook helps you answer questions from employers and owners, and verify jobs are in compliance. Order both tools together and Save 15%! When it comes to fuel gas safety, nothing compares to the comprehensive 2015 National Fuel Gas Code and Handbook Set for engineers, contractors, consultants, AHJs, designers, and architects. Interested in other set editions of NFPA 54? Use the drop down menu above to select the set edition year you need. The 2012 NFPA 54 Set combines everything you need to know about fuel gas safety and compliance for 15% off. Bring your knowledge about fuel gas-related fire and explosions risks up-to-code with the latest safety protocols with the 2012 edition of NFPA 54: National Fuel Gas Code and Handbook Set. Available at a savings from the Code source, this resource set helps you work safely around fuel gas installations, while you answer questions from employers and owners, and verify jobs are in compliance. When it comes to fuel gas safety, nothing compares to the comprehensive 2012 National Fuel Gas Code and Handbook Set. Get the latest fuel gas safety requirements plus the guidance to apply them right with the 2009 NFPA 54 and Handbook Set! Move ahead with today's rules and improve protection against fire and explosion hazards with the NFPA 54: National Fuel Gas Code and Handbook Set. This hardworking team brings you the industry's most powerful tools -- the 2009 edition of NFPA 54 plus its essential companion Handbook, packed with practical application assistance and training advice, at savings of 15%. Don't let questions or confusion compromise safety and job performance. Order your National Fuel Gas Code and Handbook Set today and be ready for total compliance.